Next week, I'm going to a big poker tournament with a group of online poker players that won their way to the Caribbean. 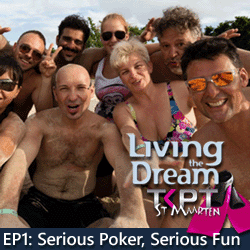 They'll be playing in the Main Event at the TKPT tournament in St Maarten. Like I did when we took other online satellite tournament winners to Punta Cana and to Seefeld, Austria, I'll be publishing a series of videos starting April 27th. The web video series will follow five online satellite tournament winners from Intertops Poker and Juicy Stakes Poker competing in the TKPT Caribbean Main Event. This is the third time we’ve taken a bunch of online tournament winners to a big live tournament. It’s interesting to watch the guys adjust to the different kinds of players they encounter at international tournaments. Tim and Chris were with us at CAPT Seefeld so it’ll be good to hang out with them again! I'll be hanging out with the five online players -- Tim O'Keefe, Chris Perkins, Elena Stover, John Curcurcu and Gabor Kresco -- as they compete in the Main Event and as they enjoy everything else the tropical paradise has to offer. In the preview video, tournament organizer Thomas Kremser talks about what to expect next week. Kremser is organizing island excursions for players like zip lining, ATV touring and a party bus with DJ and open bar. In February, I went with Living the Dream to CAPT Seefeld in Austria with a group of online satellite tournament winners. Before that, we went to CPT Punta Cana. The next poker adventure will be in July when winners of current online satellite tournaments will go to the European Poker Championships at CAPT Velden in Austria.